Whether it is Whitehaven Beach in the Whitsundays, Sydney Harbour for New Years Eve, the remote Kimberly Coast in Western Australia or untouched regions of the Great Barrier Reef, Australia has an abundance of stunning destinations for the global superyacht fleet. Our superyacht industry has a strong global reputation for delivering to client’s expectations and in fact more often than not, we over deliver. We have leading refit specialists, world class agents and charter brokers, impressive project managers and interior designers, first class marine and berthing facilities, the best of local food and beverages that can meet every challenge and a supply chain to service your every need. The fact you can charter here for 365 days of the year creates a unique opportunity unlike the seasonal locations in the Northern Hemisphere. On top of that Australia has a strong reputation for quality, innovation and efficiency in the superyacht sector, considerable opportunities exist for Superyachts that venture down under. 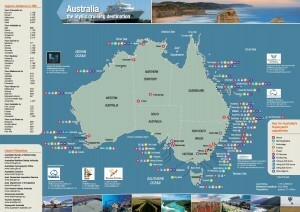 The Superyacht Australia pocket map demonstrates Australia’s capabilities in terms of capacity and facilities for superyachts and also the idyllic and iconic destinations and events Australia hosts. One side folds out to an A3 map of Australia, featuring images of iconic Australian destinations, unique experiences and Australia’s marinas and contacts. 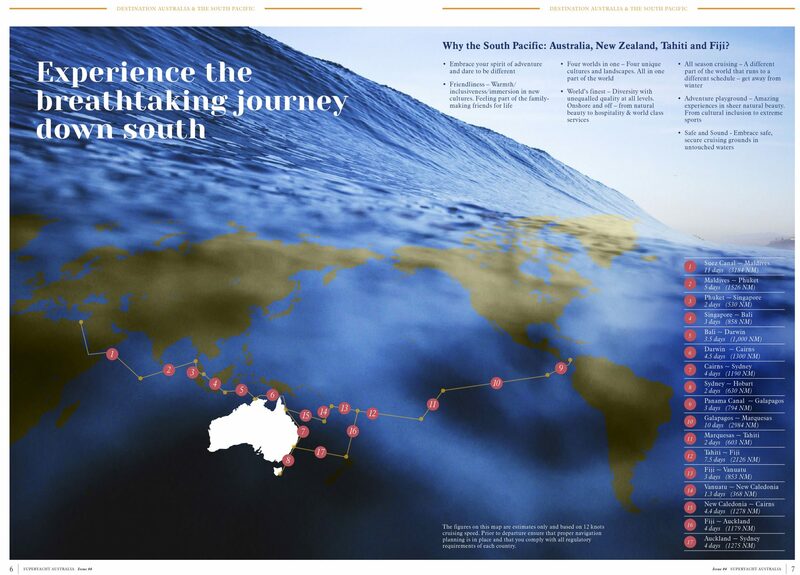 The other side of the A3 is a categorised business directory featuring Superyacht Australia and cluster members who have the facilities and are service providers for superyachts. The pocket map will be distributed as the key marketing collateral at Monaco Yacht Show, Fort Lauderdale International Boat Show and METS (The Marine Equipment Trade Show). Tourism Australia is strong supporters of developing the Australian superyacht industry and have aligned with Superyacht Australia on many projects including this one.